Last summer, I took my niece shopping at an urban clothing store in New York City. While she shopped, I couldn't help but notice the music blaring on the store's speaker system--it left my ears ringing and my nerves shot. I could only take it for about a half hour before I just had to leave the store. I'm sure the music was designed to appeal to the younger crowd shopping there--AKA not me!--and certainly music has been shown to impact buying behavior. But it made me wonder: What about the people who work there and can't leave the store? Does the music impact them? 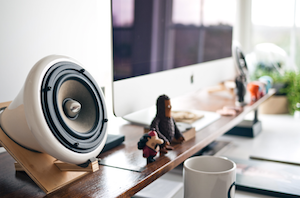 Now, a new study suggests that background music can influence people in surprising ways that could have special relevance for employers designing their workspaces. In the study, recently published in the Journal of Organizational Behavior, researcher Kevin Kniffin of Cornell University and his colleagues mimicked a workplace by paying university students to participate in an economics game, while listening to music. Participants received tokens (worth money at the end of the experiment) and could choose to anonymously donate some of them to a pool, where they would be multiplied and redistributed among the players. Since players stood to make the most money if everyone gave all of their tokens, the number of tokens donated acted as a measure of their willingness to cooperate. During the many rounds of the game, participants were randomly assigned to listen to either happy, rhythmic music (e.g., the pop song "I'm Walking on Sunshine" by Katrina and the Waves) or unhappy, non-rhythmic music (e.g., the heavy metal song "Smokahontas" by Attack Attack!) in the background. The results showed that participants who listened to happy music were more likely to cooperate, regardless of their age, gender, or academic major, than those who listened to unhappy music. Perhaps that's not surprising, if happy music makes us happy and happy people are more cooperative. But that wasn't exactly what was going on; in a second experiment, researchers found that happy music was linked to increased cooperation whether or not it boosted participants' mood. Here, researchers added a control group who didn't listen to music and measured participants' moods before, during, and after playing the game. Results again showed that the happy-music group cooperated more than the unhappy or no-music groups. And, while a better mood was tied to greater cooperation, it couldn't account for the differences between groups. In other words, something else about happy, rhythmic music seemed to be encouraging cooperation. According to Kniffin, this finding fits with previous research on music showing that it can increase cooperative behavior through synchronization among listeners. "When people are presented with a steady rhythm or beat, they are inclined to mimic that beat and, in turn, get in sync," he says. "That translates naturally into more cooperation during decision-making." Though results from this study are preliminary--for example, the researchers didn't consider the impact of participants liking, disliking, or being familiar with the songs--they do point to the fact that music could impact workers, as well as clients or shoppers. Kniffin believes this is especially relevant to employers. "Compared with expensive off-site team-building retreats, our findings suggest that inexpensive modifications to the office soundscape can boost mood and performance," he says. More research needs to be done, though, he says, as too little attention has been paid to how "atmospherics"--the background qualities of the workplace environment--impact worker performance. Some of his previous research has found that even simply having workers eat together can increase job performance; yet the employee social climate is often overlooked. If his findings on happy music hold, Kniffin believes that they may translate into changes in the workplace that could benefit employees and employers without hurting the bottom line. Hopefully, that New York department store and others like it will take note.